Industries across Europe are threatened as European Union emission rules for Volatile Organic Compounds are tightened. Now an aircleaning invention from the University of Copenhagen has proven its ability to remove these compounds. And in the process they have helped a business in the Danish city of Aarhus improve relations to angry neighbors. In deepest secrecy the inventor Matthew Johnson from the Department of Chemistry at the University of Copenhagen has been collaborating with an investor, INFUSER, in mounting and testing a revolutionary air cleaning device at the Danish industrial plant, "Jysk Miljoerens". The reason for keeping the testing secret, was that they wanted to be absolutely sure that they could in fact remove the pollution before going public. Now their measurements are concluded and the results are in. And the device actually works. 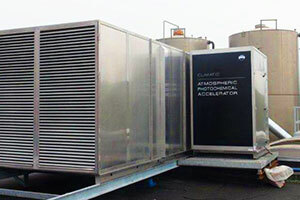 "The self cleaning mechanism of the atmosphere is so simple, that we could wrap it in a box and use it to clean the air in houses and businesses. At the department of Chemistry atmospheric chemist Matthew Johnson invented and patented the air cleaning method which is based on the natural ability of the Earth atmosphere to clean itself. In a process triggered by sunlight, polluting gasses rising into the sky start forming particles when they come across naturally occurring compounds such as ozone. The newly formed particles are washed out of the atmosphere by rain. Once the rain hits the ground, the atmosphere is clean again. In other words the whole process is nature's own purifications works, explains Professor Johnson. ”I have investigated the self-cleaning mechanism of the atmosphere for years. Suddenly I realized, that the mechanism is so simple, that we could wrap it in a box and use it to clean indoor air. This makes for a better indoor climate, and in this particular case it also removes smells from this industrial process allowing the company to stay and making the neighbours happy," says Matthew Johnson. For the INFUSER CEO Lars Nannerup the new air cleaning method was a heaven-sent. For some time he had wanted to establish a cleantech business delivering green and sustainable solutions to industry. In scientific terms, Matthew Johnsons patented process is known as an atmospheric photochemical accelerator. The whole process is housed in five aluminium boxes on the roof of the Aarhus business. Compared to traditional methods the new process outshines by removing pollution rather than diluting it, as is the case when we send smoke up a chimney. The method requires no filters, so maintenance is inexpensive. It consumes very little energy, so its climate impact is negligible. Finally it removes the need for a chimney which would have been costly to erect. For all these reason INFUSER and the photochemical air-purification was the right choice for Jysk Miljoerens. ”It's no big secret, that we've faced challenges in getting rid of the smells originating in our treatment plant. For this reason we were very happy when INFUSER got in touch, saying that they had a solution to our problem. Unlike other solutions that we've investigated to combat smells and air pollution we can now see, that INFUSER delivered. They've solved a pressing problem for Jysk Miljoerens, and for the city of Aarhus," says CEO Naldal. Particles such as fungal spores, pollen and airborne ashes.